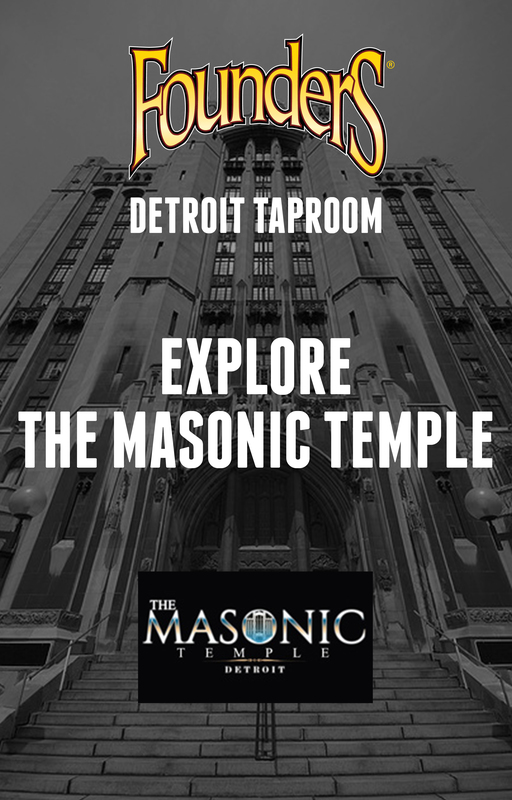 SOLD OUT Founders Taproom Detroit - Masonic Temple Tour - Founders Brewing Co.
We are excited to partner up with our neighbors once again to offer you the opportunity to tour the Masonic Temple Detroit and enjoy some Founders beer! This is a great opportunity to see the Masonic Temple behind-the-scenes, learn all about the history, and enjoy a beer and appetizers with friends at Founders Taproom – Detroit afterward. Included with the tour is a voucher for a pour of a Class 1 Founders beer and catered appetizers in our Barrel Room at our brewery located directly across the street from the Masonic Temple at 456 Charlotte St. Food and drinks will take place immediately after the tour. -Parking is available behind the Temple, access the lot using the alleyway off of 2nd Avenue. -Tour participants should enter the building through the doors under the marquee sign in the rear Masonic Temple parking lot. -Cameras are allowed, as long as photos are for private, non-commercial use. Lights, tripods, and other equipment is not. -After the tour ends, we will head straight to Founders to enjoy some beer and apps! We will have table games available as well, and food for purchase for those looking for something a bit heavier. This event is 21+ only and tickets are limited.